Durborough Film in WW1 Series "Apocalypse"
Last year, the same team that collaborated on the renowned World War II series Apocalypse produced a similar documentary series on the Great War. As with the previous production, the new series has some remarkable colored footage including scenes from Wilbur Durborough's film On the Firing Line with the Germans (1915). All together, about three minutes from the original Durborough film were used for Apocalypse, and these were edited in episode 2 "Fear". According to an interview with the producers, the footage was taken from the film collection at the Library of Congress. It is a peculiar experience to see the original shots in full color and we leave it up to the viewer whether to prefer the black and white footage or the colored scenes. 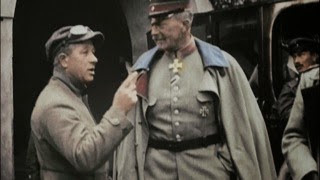 As an example, here's a scene showing Durborough with a German officer, wrongly introduced by the narrator as General Erich von Falkenhayn.